"Accelerate your Internet with Google DNS"
If you want to change your DNS and get the one from Google, which is public, Google DNS Helper will be very useful to you. Thanks to this you will be able to surf the Internet with greater speed. On the other hand, you will enjoy a more secure connection, which is always appreciated. 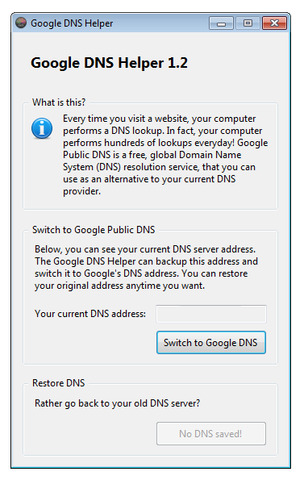 To activate the corresponding DNS change, simply click on the "Switch to Google DNS" button. If you want to recover your DNS again, click on "Restore DNS". All changes are implemented in a matter of seconds. Google DNS Helper does not require any installation.